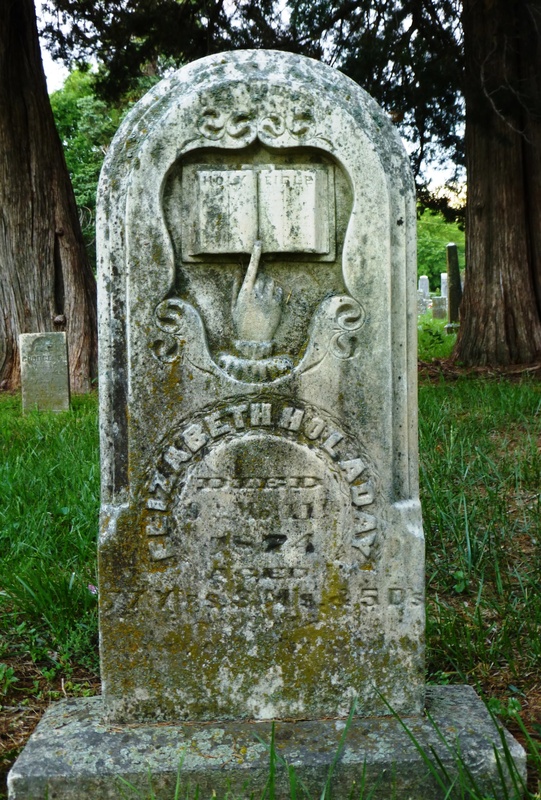 The image of hands in some form is very common on gravestones and they are most often shown praying, pointing, clasping or blessing. 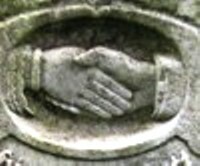 Clasped hands shown in a handshake identify the deceased meeting his maker and is a symbolic of a welcome into Heaven. 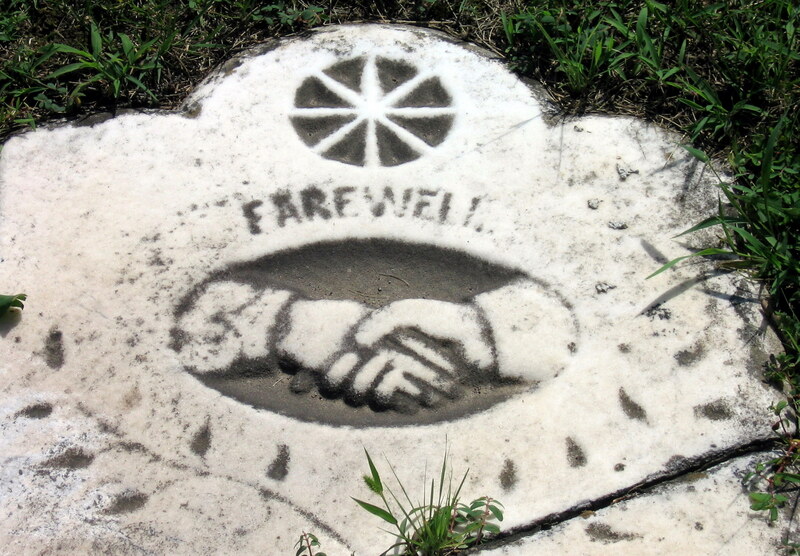 The hands are often seen with the word Farewell inscribed above or below the hands: farewell to earthly existence with the hope of meeting in eternity. 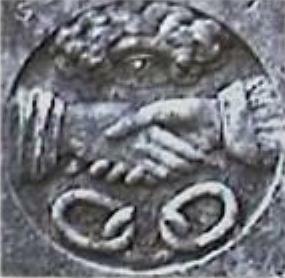 The depiction of a man holding a woman’s hand (identified by a frilly cuff) indicates marriage or a close bond between individuals, and represents unity and affection even after death. 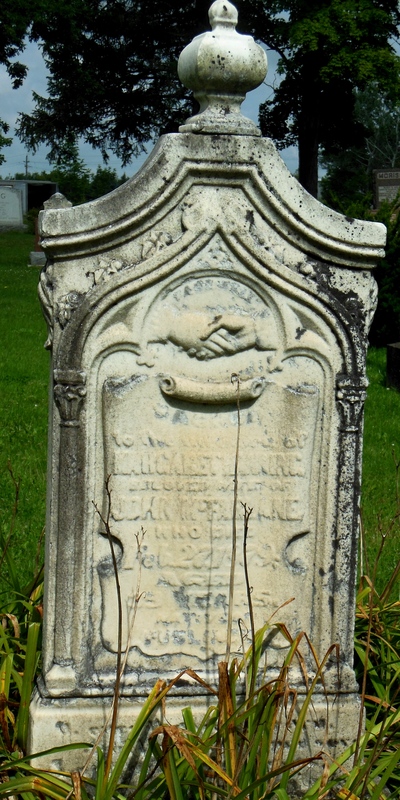 The person who died first holds the other’s hand, guiding the spouse to heaven. 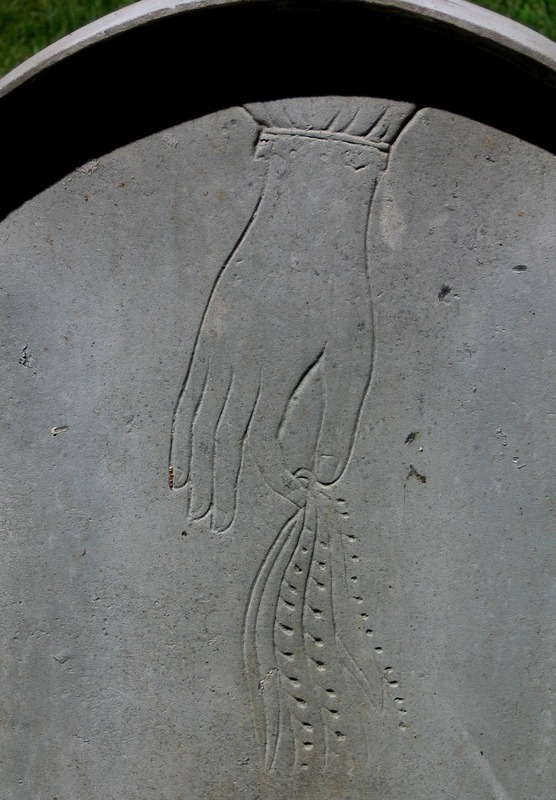 Most of the hands illustrate the right hand in a grasp with fingers overlapping the other hand while the left hand is open. 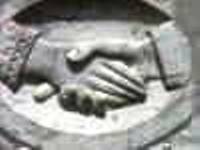 When the handshake is enclosed within a wreath of flowers it denotes heavenly joy and bliss. 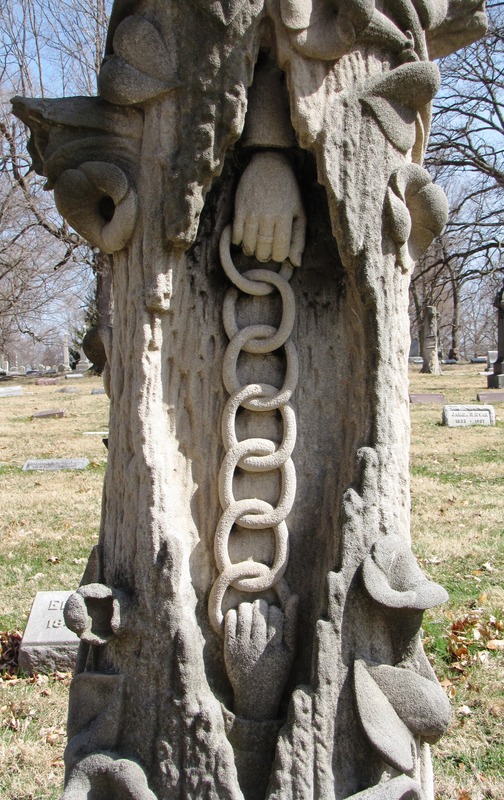 A hand holding a chain with a broken link symbolizes the death of a family member. 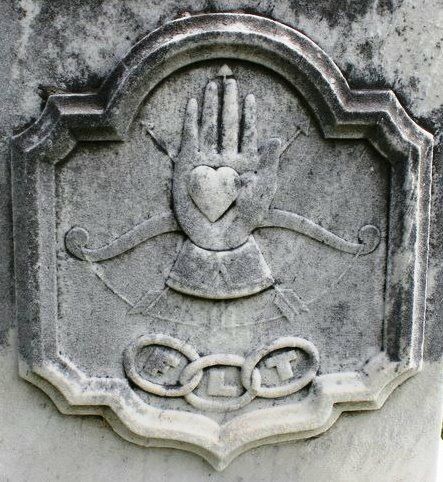 A hand holding a heart is a symbol used by the fraternal organizations I.O.O.F (Independent Order of Odd Fellows) and Masons. 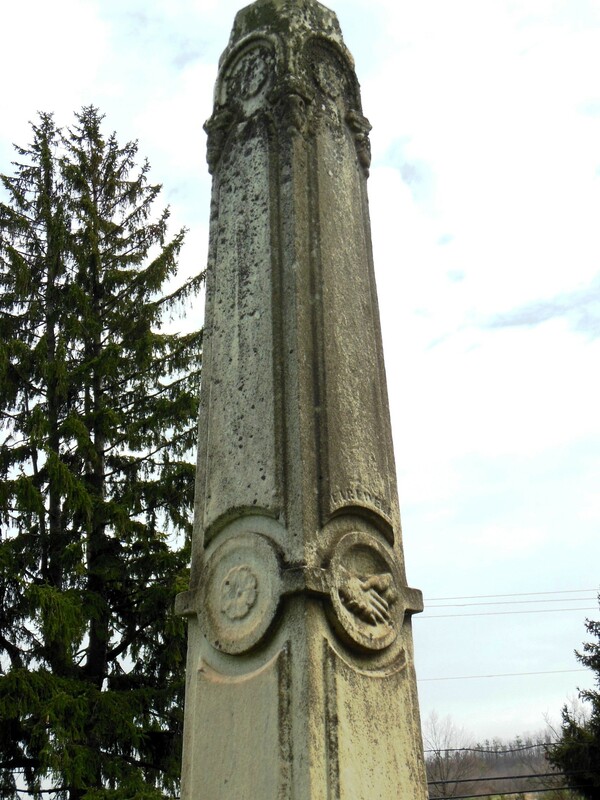 It symbolizes charity and is common on 19th century memorials. 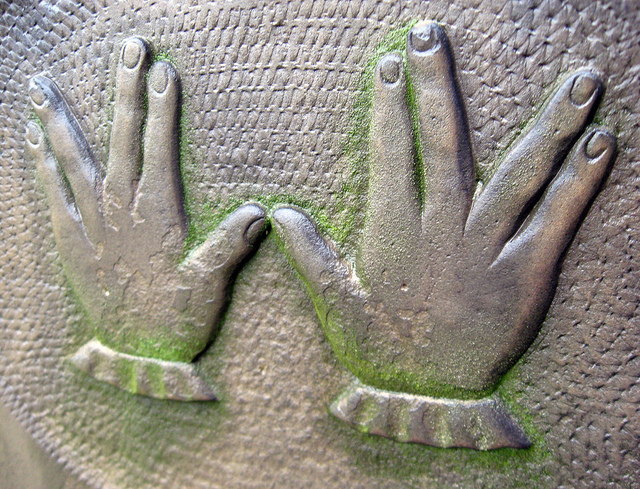 Hands making the “Live long and prosper” sign (hands touching at thumbs and sometimes forefingers joined) represents members of the priestly tribe of Aaron. 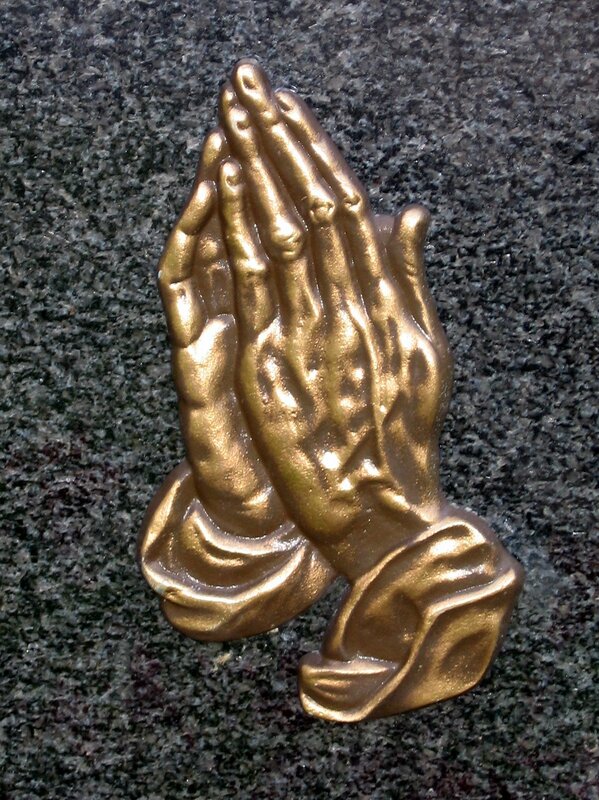 It is a benediction or blessing. This image represents the hand of God bringing a soul unto himself. 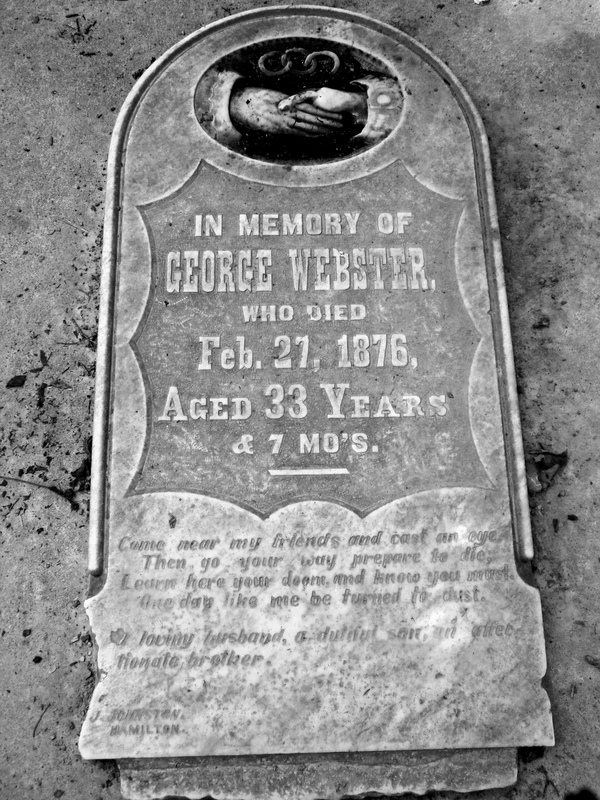 Fraternal and social organizations were very popular and evidence of this popularity can be seen in the number of grave memorials with fraternal symbols. 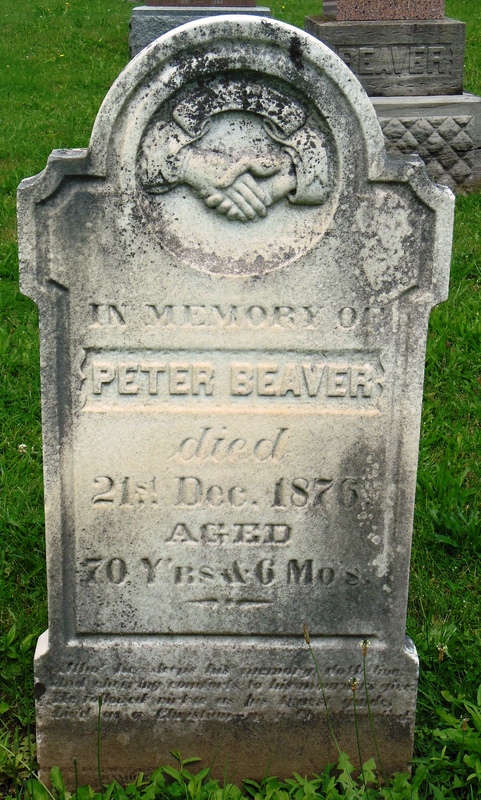 Many of these once popular societies are now almost non-existent. 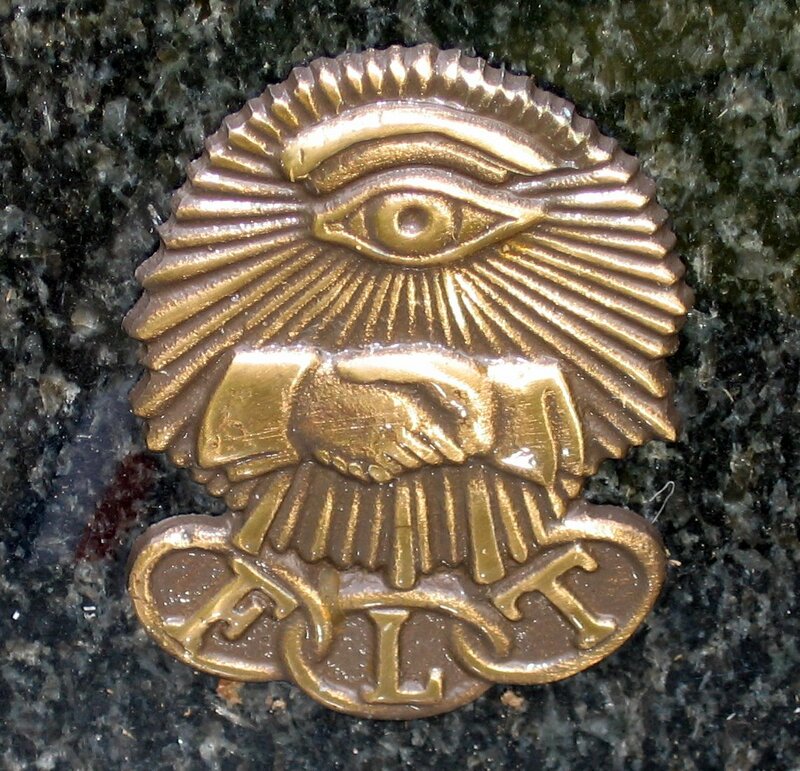 The all-seeing eye symbol is associated with Freemasonry or the Independent Order of Odd Fellows. Also called the Eye of Providence or Eye of God, its origins date back to the Eye of Horus in Egyptian mythology and symbolizes the all-knowing and ever-present God. 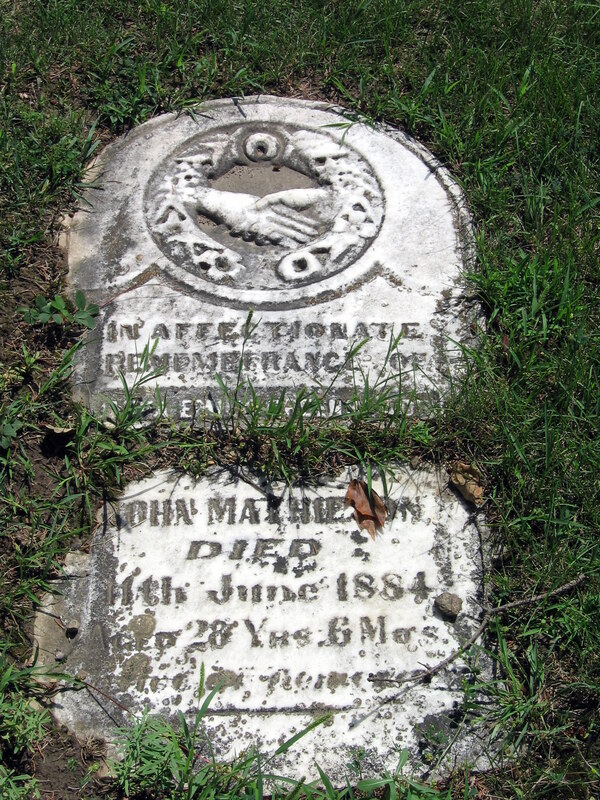 Clasped hands are symbolic of a welcome into the heavenly world from the deceased’s maker. 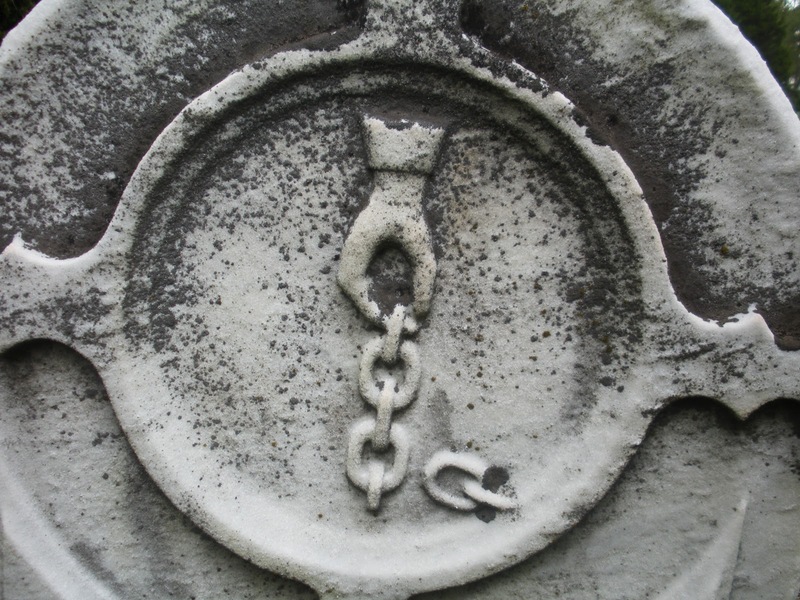 The three linked rings (the chains that bind the Fraternity) are synonymous with the Odd Fellows and the letters FLT stand for Friendship, Love and Truth. 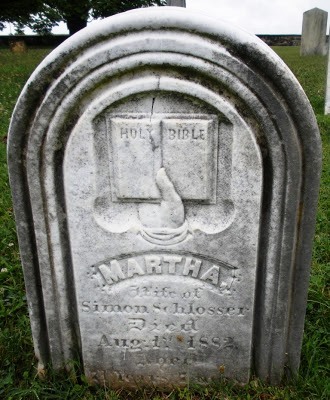 The image on this stone shows clasped hands. 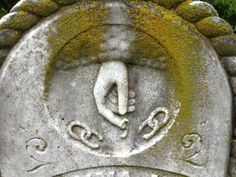 However, the forefinger of the right hand is pointing, and is most likely a secret handshake as identified in the Album of Unwritten Work, a volume owned by each Grand Lodge which explained the principles and rituals of the I.O.O.F.